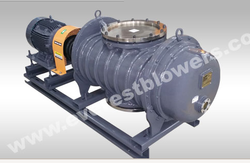 Everest Blowers Pvt Ltd - Manufacturer of everest mechanical vacuum boosters pump, tri lobe roots blowers & biogas blowers and compressors in New Delhi, Delhi. EVEREST, a leading manufacturer of Air Blowers in India offers twin Lobe air blower available for flow rates from 25 r!Q/fl[ to 10,000 ra/hr in sing0 stage 8 up to a, capacity 0 parallel configuration, for working pressures up to 1 Kg/crn2. 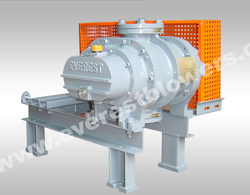 Everest Air Blower is a positNe displacement machine, which discharge a constant volume of air when operated at a constant speed. These machines are suitable for both pressure and vacuum applications. Pressure is not developed inside the blower but by the demand of the system. Differential pressure, therefore, varies to meet the load conditions and system resistance. Horsepower required is proportional to the differential pressure across the suction and discharge of the blower. The air delNered is 100% oil free. They are extensNely used 0 cement plarss, pneumatic conveying systems, effluent treatment plarss for aeration, water treatment plarss for backwashing <Afters, blending of powder material, agitation of chemical solutions, aquaculture, electroplating, etc. Special BiogassCas Blowers are also available. Everest blowers are manufactured on sophisticated CNC machines to ensure high quality of workmanship resulting in interchangeability and high performance. Blower acoustic hood assemblies are also available to cut down noise to the acceptable tolerance range. They are available as package units, ready to install or as bare units for replacement. 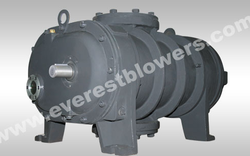 EVEREST Mops Blowers I Compressors based on Positke Displacement Air Blower principle, have been specially developed 0 pumping of Mops. These are generally used in biogas lines to boost the gas pressure to meet the burner input demand. These are generally vertical flow type in construction, i.e. 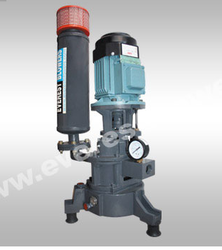 suction top A discharge at .ttom, so as to prevent any accumulation of corroske matter inside the casing. Since they operate in closed P. suction a. discharge silencers are generally not required. Special material of construction, lubrkation and sealing arrangements ma. them ideal choke for Mops boosting applications. Provision for a vacuum switch is provided at the inlet of the blower, so that incase the Mops generation falls below the pumping speed of the blower, the blower trips and this prevents vacuum overloading. Similarly provision a pressure switch is provided on the discharge line to safeguard the blower against excesske discharge pressures. 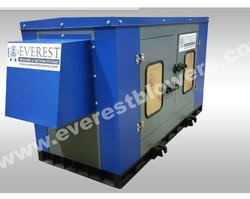 BIOGAS BLOWERS I COMPRESSORS Special blowers, capable of handling di.rent gases, are also available at Everest. Material of construction a. constructional details vary to meet di.rent gas require... For inflammable and tor. gases, leak tightness is ensured. Bask designs are modified, depending upon the nature of gas to be handled and customers' requirements. Water jet injection cooling can also be provided to keep the gas temperatures low. EVEREST, leading man.cturer of Roots Blowers in India, introduces the all new TAW. Roots Blowers. T... technology means blowers have IS tips exposed to 120 degrees around the rotor instead of MO degrees as in a bidobe blower. This provides a sti.r rotor set, meaning less deflection at any load. These blowers have been design0 keeping the specNc demands of the industry of continuous duty operation, sturdy design, reduced noise, reduced pulsations and vibrations, longer bearing and minimal maintenance in mind. Everest Blowers are produced on the latest state-of-ad CNC machines from Haas (USA) a. HN1T (India), thereby ensuring a quality product. These blowers are deNgned h continuous.. service. Complete package un. are shipped with all essential accessories and electric motor, ready to install, on plug and play concept. An Everest TAW. blower is supplied with buiAin saMty A mon.ring equipment such as safety 1111 1111111 a. pressure gauge.